We offer Proxmox Servers in Dedicated Server format. If you need our help to troubleshoot issues or fix configuration issues for your Proxmox server, please select Premium Support under Configuration menu which is $49/month extra fee. If you need us to fully configure Your Proxmox Server and do all configuration for you 24/7, you must take 24/7 Proxmox Configuration Support which is an extra fee. Contact us for more details. You can order your Proxmox from the below links. In configure options page, select "Proxmox" from Operating System drop-down option. select 24/7 Premium support for Proxmox from Support Package dropdown menu. 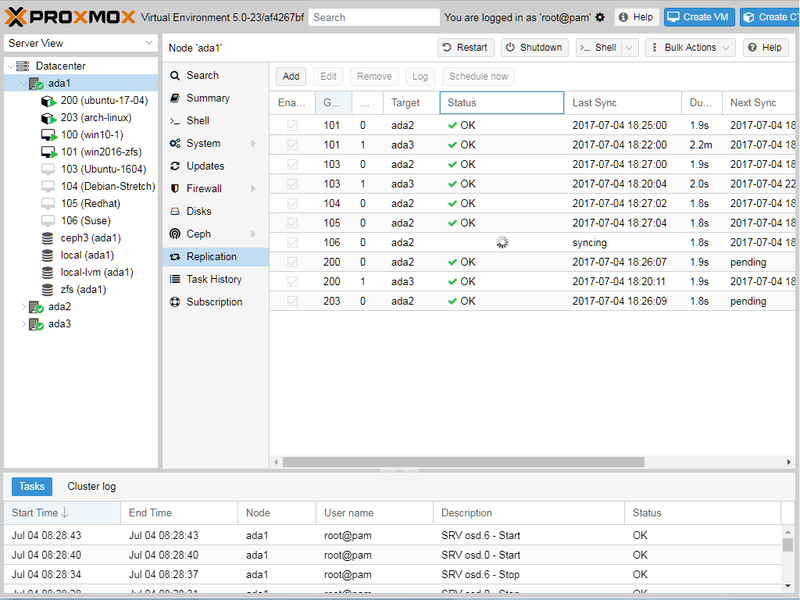 Proxmox VE uses a Linux kernel and is based on the Debian GNU/Linux Distribution. The source code of Proxmox VE is released under the GNU Affero General Public License, version 3 (GNU AGPL, v3). This means that you are free to inspect the source code at any time or contribute to the project yourself. Using open source software guarantees full access to all functionalities - as well as high security and reliability. Everybody is encouraged to contribute while Proxmox ensures the product always meets professional quality criteria. Open source hypervisor KVM is a full virtualization solution for Linux on x86 hardware containing virtualization extensions (Intel VT or AMD-V). It is a kernel module added to mainline Linux. With KVM you can run multiple virtual machines by running unmodified Linux or Windows images. It enables users to be agile by providing robust flexibility and scalability that fit their specific demands. 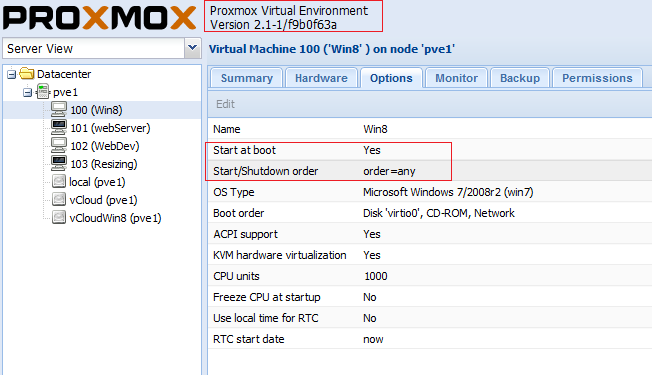 Proxmox Virtual Environment uses KVM virtualization since the beginning of the project in 2008, since 0.9beta2. Move your running virtual machines from one physical host to another without any downtime. Proxmox Server Solutions GmbH is a participating member of the Open Virtualization Alliance, an industry-consortium fostering the adoption of KVM as an enterprise-ready open virtualization solution. OVA is a Linux Foundation Collaborative Project. The Linux Foundation is a non-profit consortium dedicated to fostering the growth of Linux. As a member of the Linux Foundation, Proxmox supports the advancement of Linux and KVM. 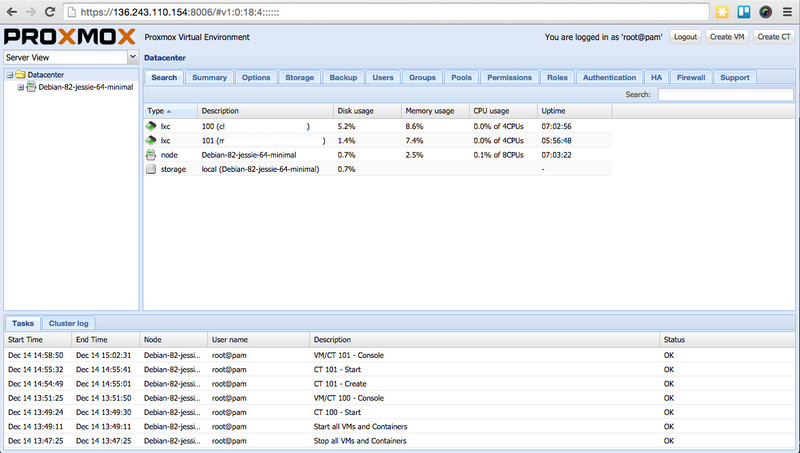 You can define granular access for all objects (like VM�s, storages, nodes, etc.) by using the role based user- and permission management. This allows you to define privileges and helps you to control access to objects. This concept is also known as access control lists: Each permission specifies a subject (a user or group) and a role (set of privileges) on a specific path. The integrated backup tool (vzdump) creates consistent snapshots of running containers and KVM guests. It basically creates an archive of the VM or CT data and also includes the VM/CT configuration files. KVM live backup works for all storage types including VM images on NFS, iSCSI LUN, Ceph RBD or Sheepdog. The new backup format is optimized for storing VM backups fast and effective (sparse files, out of order data, minimized I/O). Proxmox VE uses a bridged networking model. All VMs can share one bridge as if virtual network cables from each guest were all plugged into the same switch. For connecting VMs to the outside world, bridges are attached to physical network cards assigned a TCP/IP configuration.